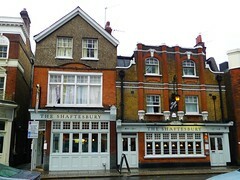 Previously known as the Shaftesbury Arms, it was renamed to the Shaftesbury following a major refurbishment in Spring 2012. According to their website as of May 2012, food is served until 10pm every day and there's a quiz night every Sunday from 8pm. bob visited on a sunday afternoon. It was moderately busy. The beer was decent enough. Last visited by bob, June 17 2012. Opening times taken from the Shaftesbury website, May 2012. Last edited 2013-08-12 17:22:18 (version 11; diff). List all versions. Page last edited 2013-08-12 17:22:18 (version 11).